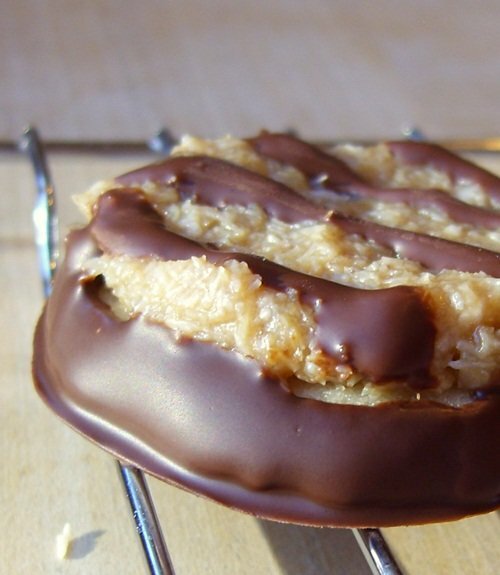 Samoa Girl Scout Cookies: Dairy-Free & Vegan! You asked, and I am here to deliver. Truth be told, I was really hoping there would be more votes for the Tagalongs or Peanut Butter Patties. But when I posted my Dairy-Free Thin Mint recipe, and asked what other Girl Scout cookies you would like to see a recipe for, the response for Samoas (or Caramel deLites) was overwhelming. So do they taste like authentic Samoa cookies? Um, well, I couldn’t tell you … I’ve never actually had a Girl Scout Caramel deLite cookie. But, I can tell you that they taste really darn good. 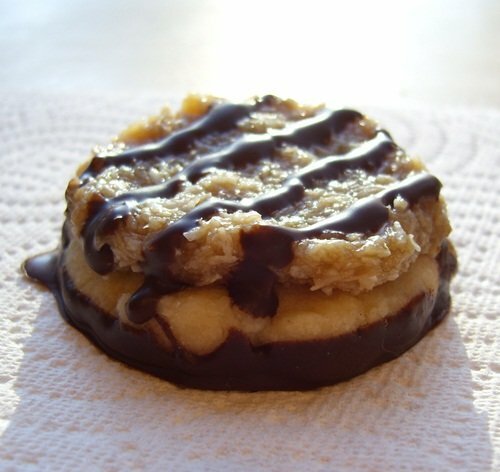 Since I’d never tried a Samoa, I needed a recipe model to work from. However, I was surprised how few recipes I found for this cookie, and how so many of them weren’t true to form. I found bar versions that didn’t even have a chocolate base (how could I deny you of an extra chocolate layer? ), I found recipes that were void of the shortbread base (true, I would have been happy without the shortbread, but I know how you all love it), and in Vegan Cookies, she skips the caramel topping altogether (a bit sacrilegious don’t you think?). I did my best to stay loyal to the original cookie, but of course had to change up the recipe a bit to make it dairy-free, egg-free, and vegan. Okay, okay, I skipped the hole in the middle too. I mean, that’s a little nit-picky don’t you think? And you get more per cookie with my simple round version. If you must, use a straw or some other small circular instrument and painstakingly remove a hole from the center of the fragile shortbread dough. But when you start cursing like a sailor, just remember my voice telling you “I told you so” in a really annoying way. Oh, and a final quick note. Something compelled me to move these cookies from the counter to the fridge for storage and I was glad I did. They will keep fine on the counter, but are awesome chilled. The shortbread cookie gets a nice light crisp and the chocolate stays firm and cool. Don’t worry, the caramel topping is still soft and shouldn’t threaten to dislodge any teeth. 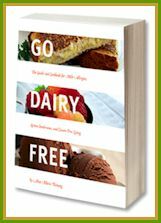 This recipe is Vegan, Dairy-Free, Egg-Free, Nut-Free, Soy-Free, and I suppose you could make it Gluten-Free by using your favorite GF flour blend in place of the plain flour. In a mixing bowl, beat together the margarine, milk alternative, sugar, and vanilla, until creamy. Add 1 cup of the flour, the baking powder, and the salt, and mix until well combined. Add in up to 1/4 cup of additional flour to keep the dough from sticking to your hands. Roll or pat the dough out on a floured surface until it is 1/8 to 1/4-inch thick. Using a 1-1/4-inch cookie or biscuit cutter, cut the cookies out and move to a baking sheet lined with parchment paper or a silicone mat. I actually (gently) cut the cookie dough right on my silicon baking mat, since the cookie dough can be hard to move. Bake the cookies for 10 to 12 minutes, or until they just begin to brown around the edges. Let cool while you prepare the caramel topping. Combine the coconut milk, brown sugar, and salt in a small saucepan and bring to a simmer or low boil. Reduce the heat to medium-low, cover, and let simmer for 10 minutes. Keep an eye to be sure it doesn’t threaten to boil over. Uncover and continue to let it slowly boil / simmer for 20 to 25 minutes, stirring occasionally. It should become somewhat thick, like a caramel sauce … but keep in mind, it will thicken more as it cools and when you add all of that coconut! Melt the chocolate chips with the coconut oil, if using. I place them in a bowl and put them in the microwave on high for 1 minute, then stir vigorously until smooth. You may need more or less time in the microwave … just make sure you do not overheat the chocolate … it burns easily. Dip the shortbread bases in the chocolate. You can either coat just the bottoms, or submerge up to the caramel layer. I tried both (each pictured above). Place them chocolate side down on parchment paper or a silicone baking mat to firm up. Then, somehow drizzle the tops of the cookies (over the caramel layer) with chocolate. I’ve read that you can do this with a fork … but that didn’t work for me. For the pretties results, piping the chocolate on would work best. I just sort of drizzled it on. Let the cookies sit in a cool area so that the chocolate can set up. Usually this will happen at room temperature, but my husband had our heat set on “melt chocolate” that day (15 degrees outside, well over 70 degrees inside), so I placed them in the fridge for 30 minutes to firm up. Fun! These are Scott’s favorite. These look delicious! The real things are amazing but I bet these are even better. These used to be one of my favorites! The tagalongs being the best! Oh and the peanut butter sandwich ones…oh good grief, I loved them all. These look perfect! I have no words. I’ve been trying to think of something witty, but all I can do is stare at the cookies. I’d make these, but honestly, I’m too lazy. And I wholeheartedly agree with the lack of a hole. I wonder if you could just roll the dough into a log and slice it? I HATE rolling out dough. That’s me being lazy, right there. Honestly, I always forget about the roll and slice method and have thus never done it. I will have to try it, but am sure it would work for these no problem. Must try these soon, too! Still have yet to make your Thin Mint recipe too, Alisa! (I was a Thin Mint Junkie back when I could tolerate a bit of dairy, when younger). These actually look pretty close to the originals and I agree, I don’t care about the hole in the middle. I’m with Shirley, these will be easy to make gluten-free. I must say, Samoas were my favorite Girl Scout cookies EVER. Haven’t had one for a decade. This recipe of yours is on my list to tweak and try. Thanks for the inspiration! Well, let me know if you do tweak it … otherwise I may just give the gf version a go myself! Hmm, I’ll have to see if I have the flours I need to make them gf before we move … I’m always happy to convert baked goodies! 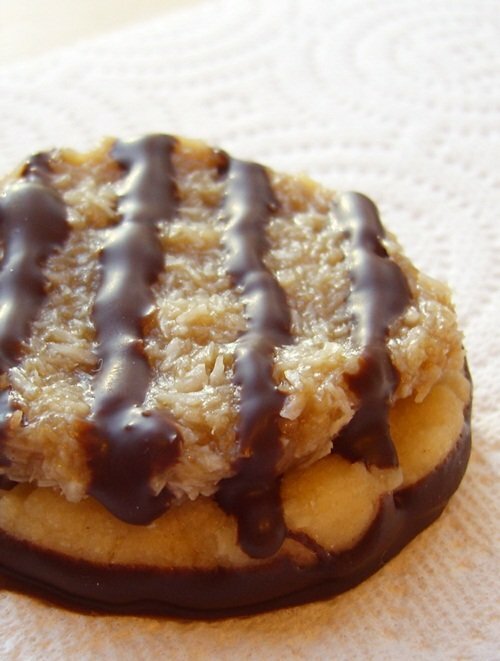 This look like a terrific version of samoas, they are our favorites! I may never have had a girl scout cookie, but man oh man. These look incredible. I’ve never had a girl scout cookie either – which I think makes creating them at home even more fun! Those really do look amazing Alisa and I agree with Shirley, they would be easy peasy to make gluten-free, yummy! Yeah, you’re like 28 right? So.Many.Emotions. I love you. I hate you. I NEED THESE. And I love you again. I’m making these as soon as I can… tackling the gluten free-ness recipe! These look amazing. These are my favorite. I could make them gluten-free pretty easily, methinks. Which is dangerous. Dangerous indeed. Wow, Alisa, Wow. I am So excited you re-created one of my favorites! I avoid these because they have high fructose corn syrup amongst other nasty things for your body. You’re a rock star!! Bookmarking! It’s ten o’clock at night, here, and I have to be at work early to do inspections, and I’m seriously wondering if I really need to get 6 hours of sleep tonight…..I could make these and totally be okay on 4….and I think I have everything in the pantry too…..wait, nope, I’m going to have to stop and get the choco chips on the way home tomorrow and do whatever it takes to make these asap! :oD (There’s not a key with a big enough grin for how happy this makes me!!!) Thank you!!!! Hope you got some good sleep … more than 6 hours! I’m willing to bet that these are the most amazing cookies I would ever put in my mouth. They look even more amazing than the original… and I used to LOVE the original! You are unbelievable! While my hubby has always been the avid Thin Mint fan, these have ALWAYS been my weakness. I am so going to make these for the weekend. And I love the vegan caramel. And yay! So glad you get that cookies with chocolate are just plain better when they are cold!! You’re just mean Alisa! I am craving chocolate and these babies are TOTALLY calling my name. Oh my goodness. Caramel, chocolate, shortbread, what more do I need? Those look so beautiful! I am instantly in love with them! THese look better than the traditional! Kudos, Alisa! Can’t wait to try them. ps, thanks for sharing the link @ Allergy Friendly Friday! UM, hello… YUM! These look heavenly! You did it again! I’m looking forward to the crummy weather coming our way so that I have a great excuse to bake these up! These are gorgeous! We are still avoiding coconut but I do miss it, the photos make me almost able to taste these in my memory. 🙂 Thanks for sharing, I found you via Allergy Friendly Friday. Oh, what a bummer! I do love coconut – not a food I would want to cut out. Hmm, now I’m wondering what would sub well for coconut. How about a frosted shredded wheat cereal? maybe chop it up and add to the caramel? Just a thought, I feel like the shredded wheat will provide the texture, look, and slight crunch. Also if there is not problem with nuts, some finely chopped almonds would be pretty tasty. I’m going to make these tonight with Cybele Pascal’s GF flour mix and a touch of xanthum gum. Hope it all works out! They look incredible. IN LOVE! I must make these at once. This would be awesome to bring to a cookie exchange this Christmas! Did you bake the shortbread at 350? Am I missing that in your recipe somewhere? They look delicious- can’t wait to try them!!! oops! Yes, 350ºF. I need to fix that! I also tried rolling the dough slightly thinner and cutting a wider cookie with the hole cut out of the center and they looked like perfect copies, but putting the coconut topping on becomes a huge task when you do this, not really worth it in my opinion. So glad you enjoyed! You are braver than me – I bet they looked lovely done with the hole in the middle though! I just made these today for Easter and they are almost gone already! My whole family LOVES them. I had to cook them way longer because I am at a higher altitude, but everything else was perfect. 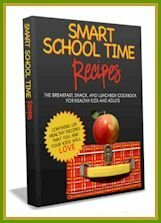 I hope you don’t mind I pinned this recipe and shared you site on my blog. So glad you enjoyed the recipe Shelly – and great to know that they work at high altitude! I always find cookies fussy when baking in the mountains. Thank you! =) Finally a vegan recipe my big sister approves of. Nothing quite like the bonding over baked goods.